It is a short scooter drive from my place in Taoyuan south into the mountains of Hsinchu county to the popular old village of Neiwan (內灣) Most people take the train from Hsinchu, or they drive their car and get stuck in massive traffic jams or lines getting in and out of the village. I can't even count how many times I've driven over on a Sunday and sat in a little tea shop drinking Hakka Lei-Cha (客家擂茶) and eating peanut sticky rice (客家麻糬.) I just take the short drive on my scooter, pass all the cars on the road there and don't have to pay for parking! Its always a win-win situation. My drive to Neiwan takes me through another Hakka town called Guanxi (關西) I noticed over the past year or two that a strange (non-Taiwanese-looking) temple popping up over all the other buildings in the village. It looked like they were constructing some sort of temple, but was nothing like Taiwan's traditional temple architecture and the entrance was always blocked, so despite being nosy and wanting to figure out what it was, I just looked at it from afar each time I passed by and gradually it seemed to become more and more reminiscent of a Buddhist 'Wat' (temple) from Thailand. The temple has since opened and my suspicions have ultimately been confirmed. The temple really is a "Thai-style" temple and is the first of its kind in Taiwan which probably makes it pretty special. The temple is named Chau-Yin Temple (關西潮音禪寺) and has recently completed construction and officially opened to the public. From the research I've done about it, it seems like the abbot of the temple and some followers went to Thailand for quite a few years and upon their arrival back in Taiwan decided to construct a new residence for their growing numbers of monks and nuns. 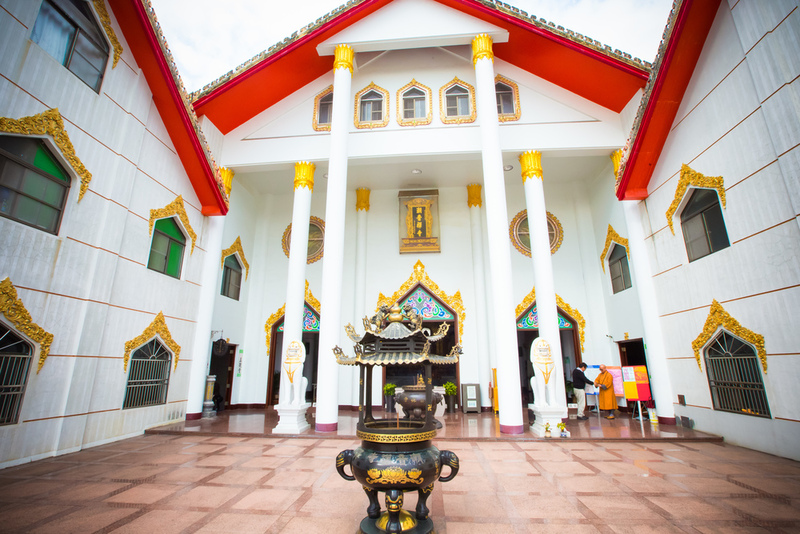 They decided that they would build a Thai-style temple to reflect their time spent in Thailand and would replace the modest monastery that they had used for decades which had become dilapidated. 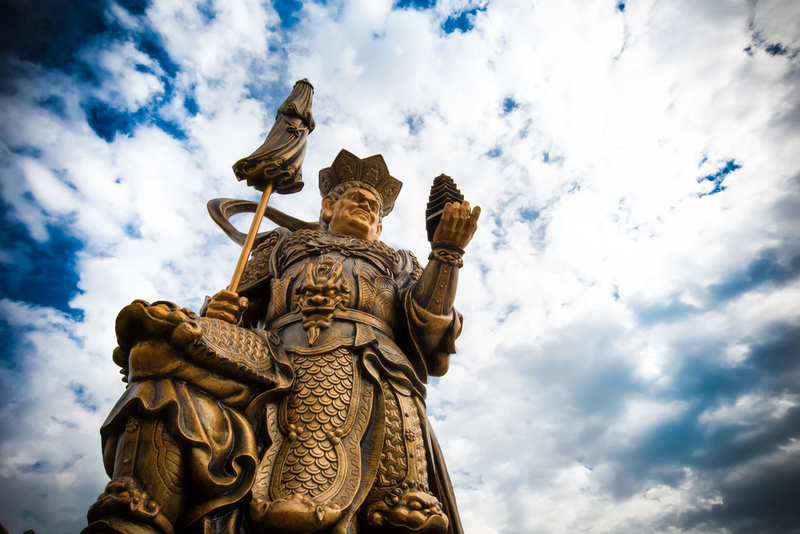 The grounds of the temple are quite large and it is next to a river bank which provides a natural surrounding to the temple despite being close to the main road through Guanxi. 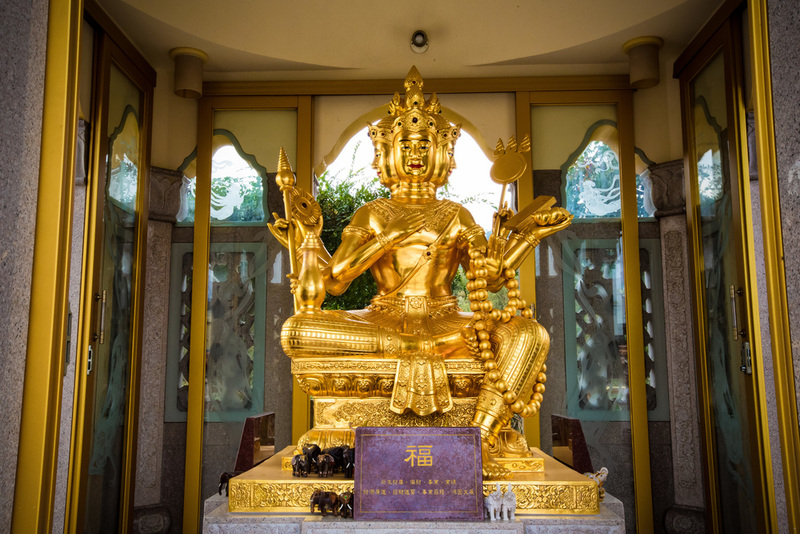 When you enter the main parking lot of the temple you are met by a giant 19 meter high sitting Guanyin statue (pictured above) as well as a small outside hall with several stone Buddha statues. Through the main gates there is a small shine to the 'four faced Buddha' (四面佛) and further on is the main building with its beautiful white walls and red roof. There isn't really much to see in the monastery other than the main shrine room. Its a functioning monastery with both monks and nuns, so you can't really wander around through people's living quarters. When I visited, I just checked out the main shrine room and greeted a few of the monks and nuns living there with smiles. They probably weren't expecting a foreign guy to be walking through so they seemed a bit curious to see me walking around. The main shrine room has a pretty large shrine to the Medicine Buddha (彌勒佛), the Shakyamuni Buddha (釋迦牟尼佛) and Amitabha (阿彌陀佛) which are all represented in the Burmese Mandalay style and a bit different than what you'd normally see in Taiwan. Outside of the temple is probably the main attraction for Taiwanese people which is is the shrine to the so-called "Four-Faced Buddha." Phra Phrom or The Four-Faced Buddha (四面佛) has become popular recently in Taiwan with shrines popping up all over the place. I have thought it was a strange phenomenon for a while now, but with so many random street side shrines popping up (I can think of at least 8 different shrines off-hand) I thought there must be a reason for it, so I tried to do some research. The photo above is a shot I took in Bangkok at the Erawan shrine last year. The Erawan shrine is an extremely popular spot in urban Bangkok for people to visit. 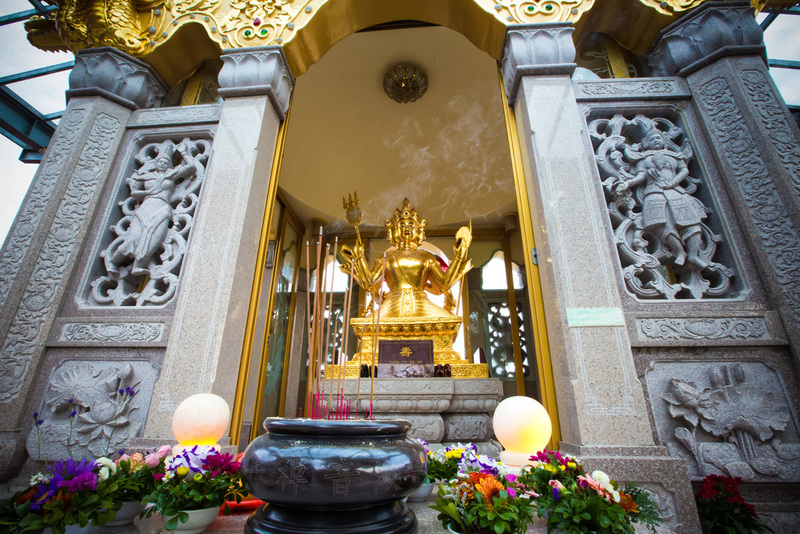 The shrine is thought to bring good luck and health to all who visit, so as you can imagine, whenever you go, you'll find a lot of people both Thai and tourist alike. The four faces symbolize the four books of the Vedas, the Hindu scriptures and the source of all knowledge in the creation of the universe. The eight hands, symbolize the omnipresence and power of Lord Brahma. The upper right hand carries a rosary, symbolizing the cycle of life from creation to death. The upper left hand carries the Vedas, symbolizing knowledge and intellect. The lower left hand carries a pot of water representing cosmic energy of creation. The lower right hand bestows grace and protection. The confusing part of the whole thing is, that the Four-Faced Buddha isn't actually even a Buddha at all - its an image of the Hindu god Brahma. To explain my confusion you have to understand that Buddhism as a philosophy splits itself into a couple of schools of thought. 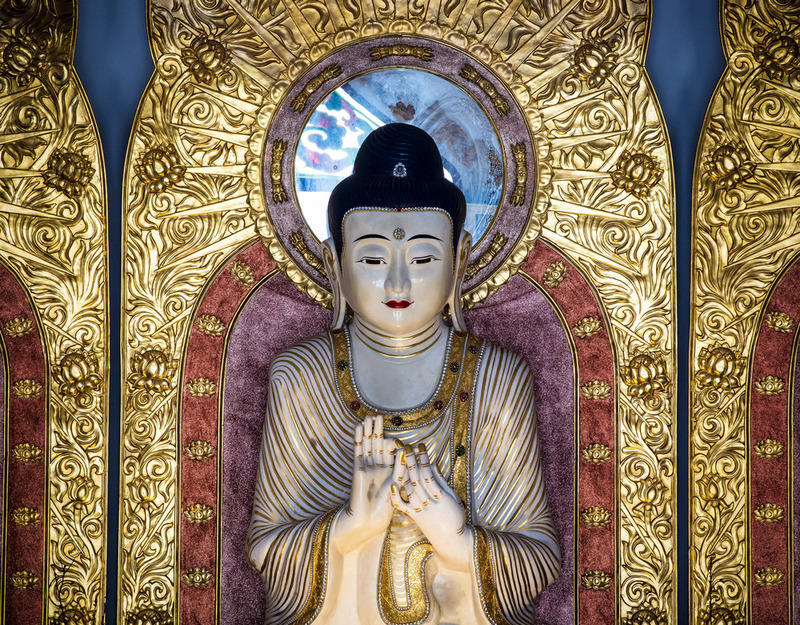 The first is Theravada which is the 'original' Buddhism and is most popular in South East Asia. Followers of this school strive for their own personal enlightenment whereas in Mahayana (which is more common in Tibet, China and Japan) followers strive for the enlightenment of all living beings through compassionate actions. This is of course a very simplistic explanation of both schools and I could go much more in depth about them, but the key point apart from their differences is that both Theravada and Mahayana Buddhism are atheistic in nature and do not accept the notion that there are any deities let alone a divine creator. 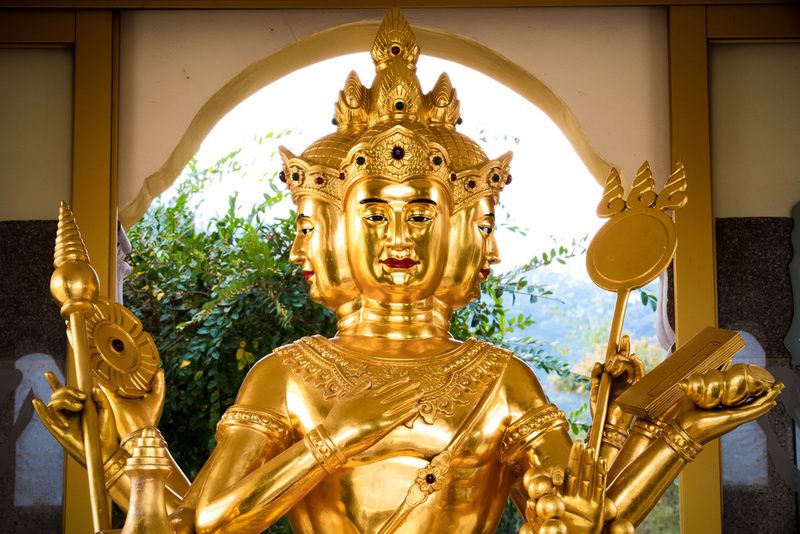 So why is Brahma, the Hindu divine creator being worshipped by Buddhists? I believe this is an issue of cultural assimilation. 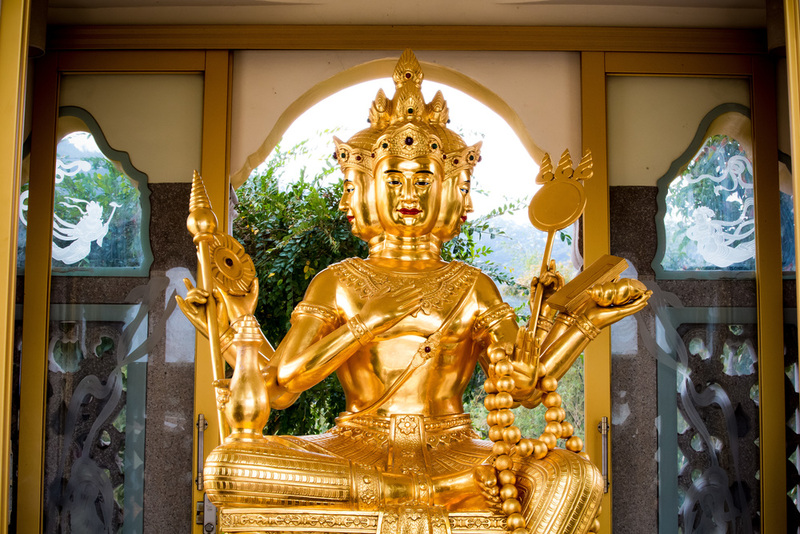 You may accuse me of nitpicking, but Buddhism should at its core reject the idea of gods - but since Thai culture has had such close interaction with Indian culture, there has been a sort of cultural assimilation of many aspects of Hinduism in Thai culture and the Brahma image in this case. My confusion in the matter lies in the fact that, it was okay for Thai Buddhists which adhere to Theravada Buddhism to assimilate Brahma into their practice, but why are Mahayana Buddhists, especially these Ch'an Buddhists in Taiwan doing the same? Is it a matter of cultural assimilation? The effects of globalization? For me, I would take a stab in the dark and explain it like this: The Taiwanese and Chinese culture as a whole are very superstitious. They tend to be very interested in things that bring good luck and try to avoid things that are said to bring bad luck. The shrine at Erawan is famous throughout Asia for bringing great luck to the people who visit so the spread of the four-faced Buddha throughout Asia thus has nothing to do with the statue being a "Buddha" or Hinduism spreading through Asia and more a matter of convenience for people who can't always travel to Bangkok. For the longest time, Taiwanese people would travel to Japan to visit UNIQLO, Hong Kong for H&M, Zara and a few other international brands. Globalization however has brought these brands to Taiwan and has reduced the need for people to travel in order to buy the things they want. If you look at it like this, bringing Phra Phrom to Taiwan just might be a great way to bring wealth, good health and prosperity to the country if you're prone to believe in these kinds of things. So, if you are superstitious, you just might get excited about that. If not, just remember that the teachings of the Buddha were ultimately just guidelines to follow and were never meant to be a religion. You can do whatever you like with your life as long as you treat others with respect and compassion. No matter how you feel about this kind of thing, if you have a chance, be sure to visit Taiwan's only Thai-style temple - It is beautifully constructed and of course quite unique in Taiwan's religious scene. If you have any questions, or you want to tell me how absolutely wrong I am about my conclusions, please feel free to comment below!